Designed on the heritage base construction of the superior class bypass capillary type mass flow sensor, the Model 3810S Mass Flow Sensor centers the focus on economy through a thorough effort towards streamlining with the view to built-in applications. 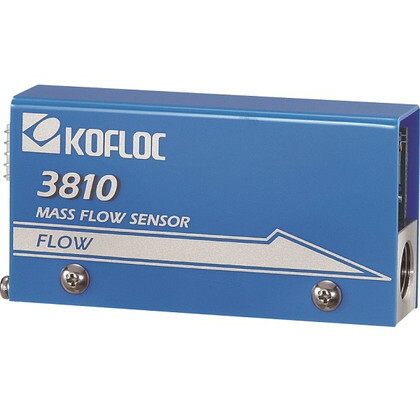 The series is one of the KOFLOC best sellers and is used by many assembly manufacturers as a substitute for the existing float type (tapered pipe type) flow meter. ・ A large cost reduction makes Model 3810S almost rival any ex-isting float type flow meter in price. ・ 0 to 5VDC analog flow outputs provide various applications such as measurements recording, control and alarm issuance. ・ The sensor is mass flow type. The user needs no troublesome calculations for flow correction due to the effects of tempera-ture and pressure.